In the old days before the interstates, federal, state and county highways were the only way to get into Florida from the northern states. Once in Florida, motorists would drive down the peninsula to the beaches on either coast and the central regions. There was no I-75, I-95 or Florida Turnpike just a couple of generations ago. I have a 1959 road map that shows the way it used to be. Many of these north-south highways are still very well maintained and are lesser traveled than the interstates. These routes take you through the places that are still authentic Old Florida. 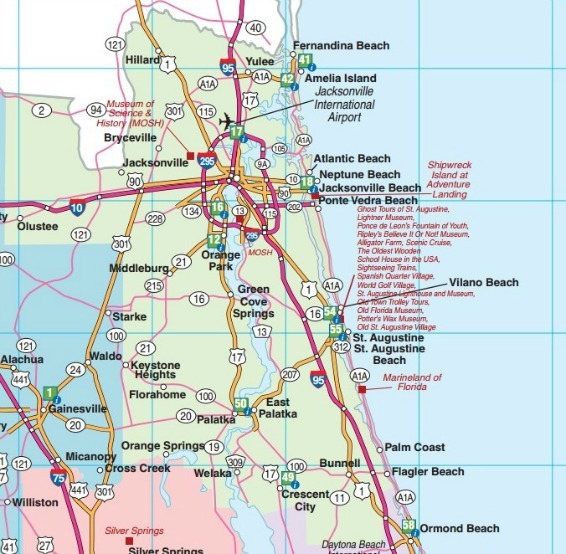 The routes described in these web pages begin in north Florida and continue south starting with US-1 and State Road A1A on the east coast and US-301 on the west. Remember that most of these routes get combined with other federal and state highways so the signage can be confusing. Just keep heading for the towns I've listed and you won't get lost. For no particular reason, I always start with the north end of the trip and proceed south. Needless to say, you can do it the other way around and have just as much fun. US-1 parallels the route of I-95 at it enters Georgia and extends south all the way through Miami to Key West. State Road A1A is usually on the east side of US-1 and quite often follows the old routes along the Atlantic Ocean. Although some of the oldest and most historic places in the state are along these two highways, they also have some of the heaviest traffic in Florida. This doesn't always make for a pleasant driving experience, but you will see a lot of Old Florida as well as a lot of new. The three maps above show the routes and how you can get on and off I-95. In the old days, this was one way to travel from the interior of Florida up north to Savannah, Hilton Head Island and all the way up to Winchester Virginia. It hugs the coast as it winds through Georgia, South Carolina and North Carolina and was known as the Seaboard Air Highway in olden times. 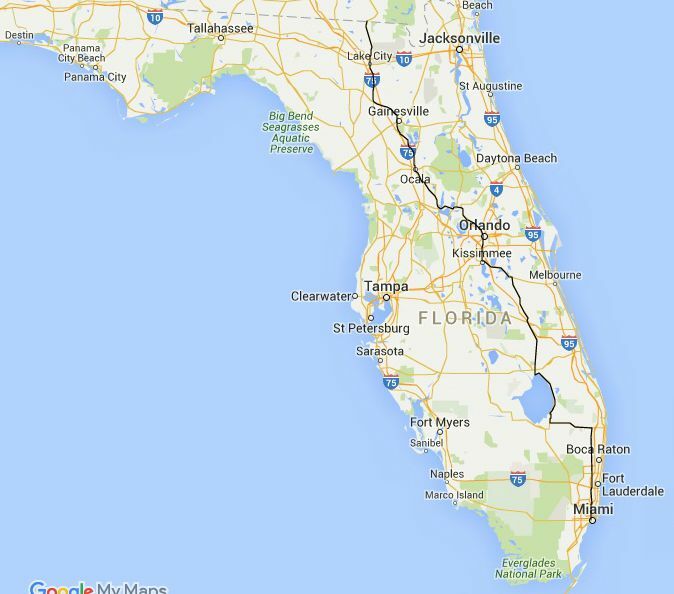 In Florida, it enters the state north of Jacksonville at the St. Mary's River and winds through some very interesting scenery, including some major cities. The route is largely rural however, but those major cities do slow you down somewhat. But I still like to go that way and see signs of Old Florida even in the big metropolitan places. State Road 17 is also known as Scenic 17 or the Ridge Scenic Highway. It is in Polk County and is just east of the busier US-27. It meanders through rolling citrus groves studded with hundreds of lakes. Some of the towns along the way are Haines City, Lake Wales, Lake Hamilton, Dundee, Highland Park, Babson Park and Frostproof. This route is mainly authentic Old Florida as you enter from the Georgia border and head south through Monticello and other quiet towns. When you get further south it becomes more and more congested from south of Weeki Wachee on into the urban metropolis of Pinellas County with Clearwater and St. Petersburg. You won't mind this congestion so much when you emerge onto the beautiful Sunshine Skyway bridge across Tampa bay and on down into Memphis and Palmetto. 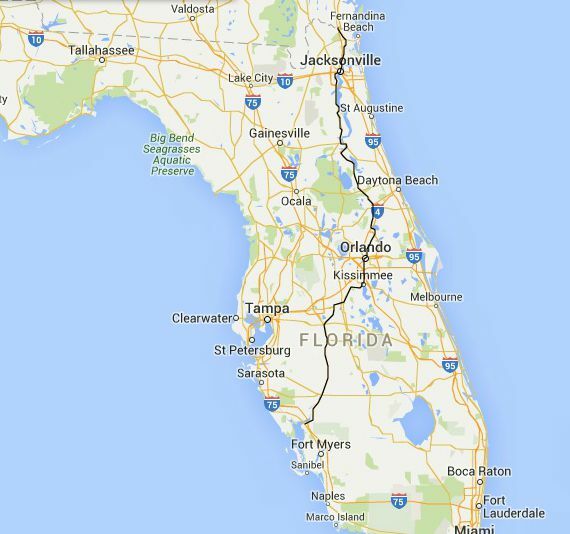 This is a historic north-south route that follows the high ridge of central Florida all the way down to Miami. It starts in the North at the Georgia border just north of the old tobacco town of Havana, Florida. 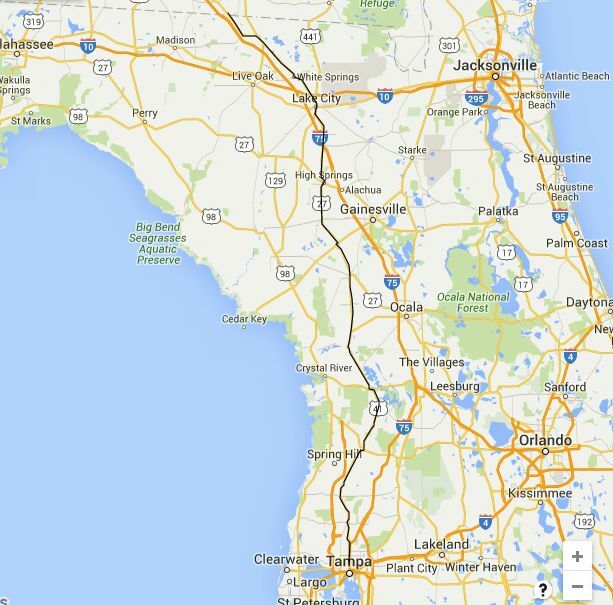 It was one of Florida's first "super highways" in the days before the Interstates. It is four-laned for much of its route, with congestion only now and then in the urban areas near Tallahassee, Ocala, The Villages, Haines City, Hialeah and Miami. I have driven the entire route in both directions, both in the days before the interstates and recently. I've seen the groves get frozen out in Central Florida and move to the areas south of Lake Wales and down to Lake Placid. You go through some Everglades farm towns and have plenty of opportunities along the way to enjoy small towns and quiet sights. You cross the interstates and the turnpike a couple of times, but in general, you will be in the country. 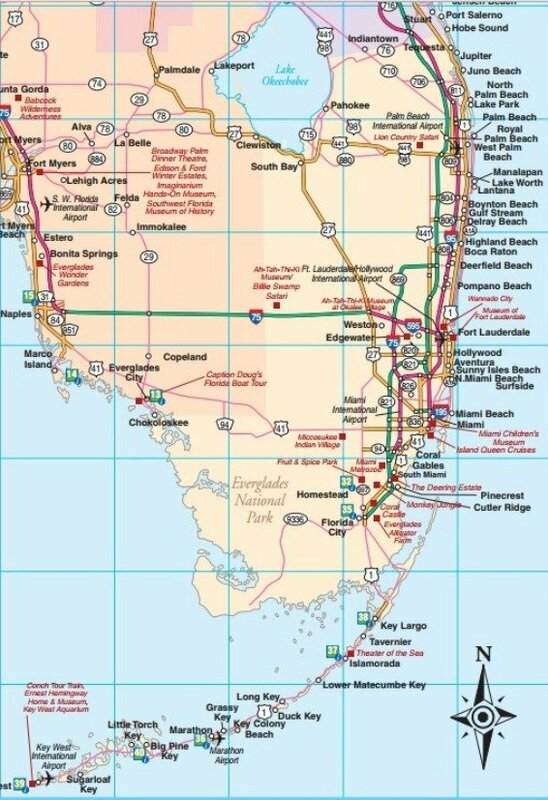 US-41 is a major federal highway on the west side of Florida that parallels I-75 for most of its route. 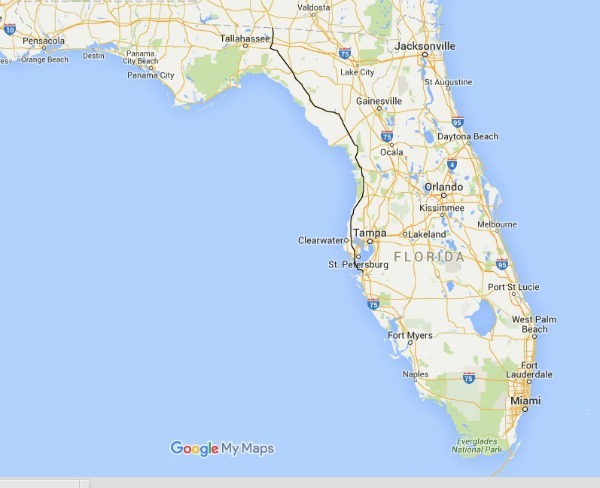 In the pre-interstate days this highway funneled people from the Midwestern states into Florida. This is why the west coast of Florida still has a somewhat Midwestern flavor. 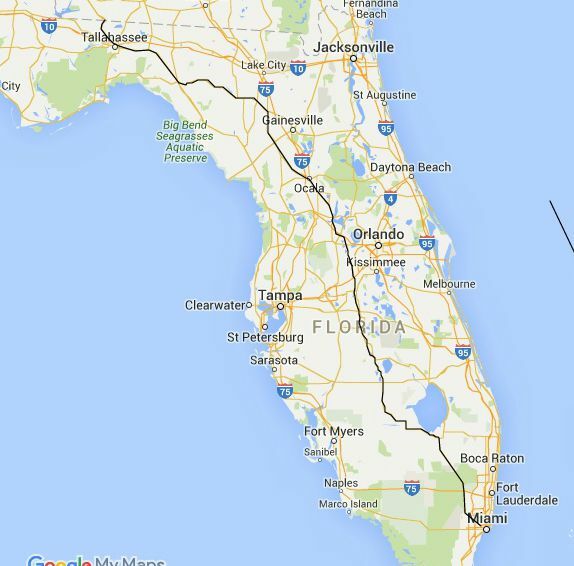 US-1 on the east coast of Florida brought down people from New York, New Jersey and the New England states. 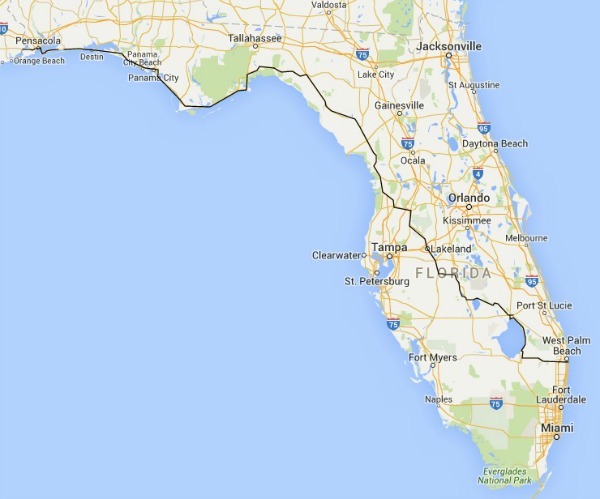 We have included only a portion of US-41, the section from the Georgia border down to Tampa. South of Tampa it is so congested it's no fun to drive any more. This is an old route that comes into the state from Alabama just west of Pensacola and meanders along the Gulf of Mexico in an easterly direction until it reaches Perry and starts its journey in a southeasterly direction down to Palm Beach. It ends at SR-A1A adjacent to Donald Trump's place, "Mar A Lago". 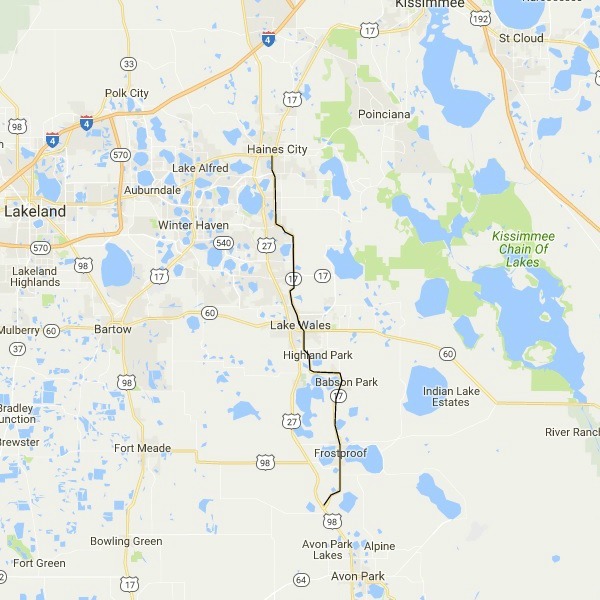 This historic route was also one of Florida's first "super highways" and is four-laned in many sections. It starts at the St. Marys River on the Georgia border and goes through many old Florida towns that the interstates have bypassed. Some of these little towns are pretty drab; others are good places to stop and eat or sleep and look at the sights. Island Grove isn't far from Cross Creek and is the site of Antioch Cemetery where the famous writer Marjorie Kinnan Rawlings is buried. Traffic is usually pretty light along the mostly rural route. It does get congested now and then as you get into the Tampa metro area and on into Sarasota. But you will see a lot of Old Florida along the way. This highway comes into Florida at the Georgia border about 25 miles north of Lake City. The highway shares signage with many other highways on its way down to Miami. Sometimes it is combined with US-301, US-27, SR-80 and several other multi-signed segments. Just keep track of the towns we list and you won't get lost. 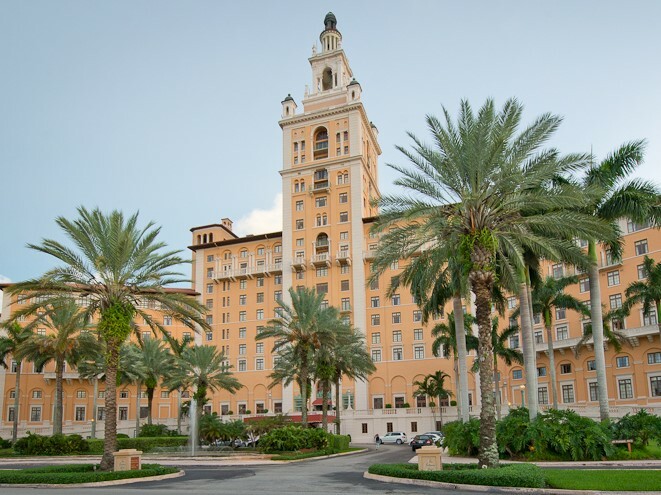 When the road enters into the urban areas of Palm Beach, Broward and Miami-Dade Counties it is often known by locals as State Road 7. It ends at Tamiami Trail in Miami. The northern reaches of this highway are rural piney woods Florida until you get to the urban and university center of Gainesville. Between Gainesville and Ocala you cross a natural marshy preserve called Payne's Prairie and can drop in on the quaint little villages of Micanopy and McIntosh. Once you get to Leesburg, traffic is pretty heavy on into Orlando and through that city to Kissimmee and St. Cloud. 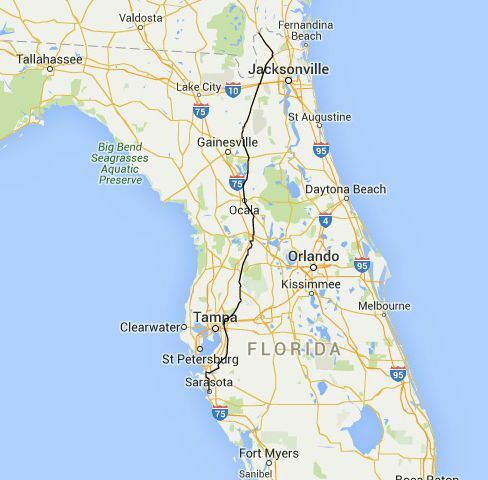 In Orlando the route is known as Orange Blossom Trail. Once you get through St. Cloud you are are in cattle country again and when you turn south at Holopaw you will have many miles of wilderness until you get to Okeechobee. Then you head east into the urban centers along the coast. As in other areas, I've driven all segments of this highway even in the urban areas. It is still more like the Old Florida I remember than the Interstate routes. For most people, however, driving in the urban segments is optional.